My neighbour has replaced the fence panels between our back gardens. I don't know whose fence panels they were originally. My problem is that the fence is now, from my point of view, very dangerous for my two young children, not to mention unsightly! The concrete gravel board under one panel is pushed up and cracked by a dead tree stump grown up from their garden that they haven't removed. They have simply planed the bottom of the new fence panel to adjust for it not being flat instead of fixing the problem. The fence panels themselves are 6 foot high, but sat in 4 foot concrete fence posts, so two foot of fence is completely unsupported with big gaps in between. They don't seem to fit properly at all even at the bits that are attached to a fence post, and are crudely wedged into the concrete posts using bits of wood here and there, which leaves lots of wobble and gaps that little fingers and hands can get trapped in and severely injured. There are also a lot of screws actually poking through onto our side of the garden, mostly at little person height which scares me to death with my young daughters. Now sadly my neighbour is a very very mean old lady who goes out of her way to make life unpleasant for everyone else, and when I knocked on her door to try and talk about what could be done to make it more safe she basically told me to get lost and that she wasn't changing anything and I best not touch her fence in any way to remove the screws or anything or she will report me to the authorities! Is there anything that I can do here, or do I have to just put a screen up blocking her fence to protect my kids? I can't seem to link or add an attachment but there's a photo at tinyurl q2efgu3 of this fencing wonder. You can see it just does not fit the concrete support posts in the slightest, and at the bottom you can just about see the tree stump pushing up through the concrete gravel board. The concrete gravel board under one panel is pushed up and cracked by a dead tree stump grown up from their garden that they haven't removed. They have simply planed the bottom of the new fence panel to adjust for it not being flat instead of fixing the problem. The fence panels themselves are 6 foot high, but sat in 4 foot concrete fence posts, so two foot of fence is completely unsupported with big gaps in between. define "seem" - have you been examining someone else's property or would a visitor spot it unprompted? There are also a lot of screws actually poking through onto our side of the garden, mostly at little person height which scares me to death with my young daughters. have these screws been added to the panels? Hi thanks for the reply, did you look at the photo I took of the fence? It's not the best photo but you should be able to see on it that the left gravel board is pushed up with a tree stump so it is on a big slant leaving it higher than the others and cracked, with a big gap underneath, if that makes sense? The tree stump is also growing directly into our garden but with it coming from her side I don't think we are allowed to touch it? About defining seem, the answer is both! You can instantly see that the fence panels don't fit properly, (though yes I did have a very good look at them after my initial first glance and oh my god that can't be how they're leaving it reaction!) Will having two foot of fence unsupported by a post be a bad idea when it gets windy? About the trapped fingers, I don't know if I've explained well or not, how the panels sit in the concrete posts, they sit in very loosely so the panels move back and forth at the slightest thing, a slight gust of wind for example, and are free to move side to side too. If they put their hands anywhere near the panels (which I know they shouldn't as it's not our fence but that doesn't mean it's never going to happen, especially with my 3 year old she will do anything you tell her not to!) it seems like an accident just waiting to happen. Unfortunately the fence is against our patio right where the girls play, rather than down at the bottom of the garden somewhere, so they are next to it a lot, it's very hard to keep them away, and I'm just really worried that a slight trip against the fence could end up with a screw in an eye or fingers smashed under a loose panel, which is why I was wondering if anyone could advise me as to my options iyswim. I've actually no idea what the screws are for! I can't see her side, I just know there are silver screws poking right through our side of the panels by over an inch in seemingly random places. Sorry I meant to say it's only been a couple of weeks since they changed the fence. this is the photo if it helps show things better. have you any idea why the person who installed that gravel board didn't ask you if they could remove that stump? I did understand what you meant about getting fingers trapped. PPS any idea why she's felt the need to switch from a 4' fence to a 6' fence? violetsky wrote: My neighbour has replaced the fence panels between our back gardens. I don't know whose fence panels they were originally. One of your biggest problems. Adding a second fence, even if possible, is a very bad idea. The neighbour may have donated a couple of panels to you. The screws are a real danger, which does have a solution, but needs the cooperation of the neighbour, irrespective of who owns the fence. Don't be tempted to knock or hammer the screws back - bad idea. 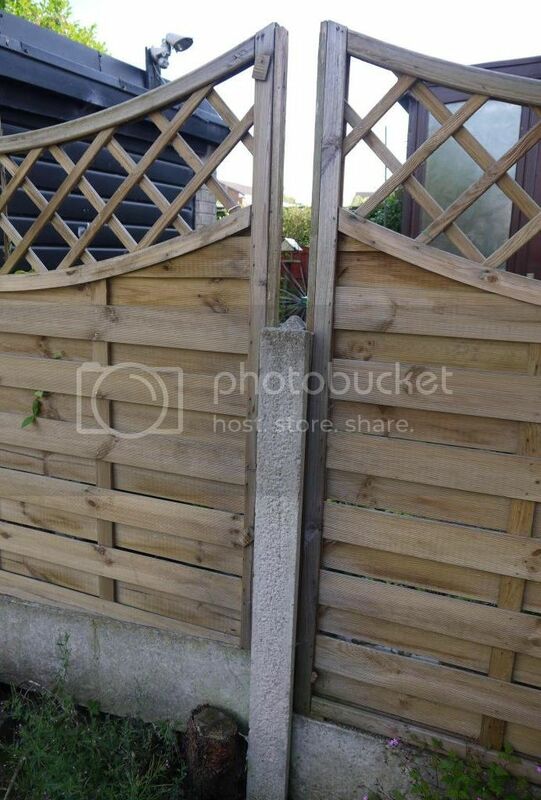 Post extenders are available to cure a very common problem with this type of fence. As for trapping fingers, the fence construction is designed with a bit of slack in to enable the panels to be slid in and out. The concrete posts are also designed to allow a bit of leeway to allow for slightly different panel construction. The old panels would have been the same unless they were not treated very well and the wood had swollen to fill the slots. Thanks everyone for taking the time to reply, and for the explanations, as you can probably tell I'm far from a fence expert! You are probably quite right Mac that I am being hypersensitive, I guess in my head after a couple of weeks of stewing over it it's become my two precious daughters vs mean old lady's dangerous fence which sounds silly but when your neighbour won't even talk and be civil to you it do make things very difficult. She is the same with her neighbours the other side, they don't speak to each other either. We would be more than happy to get the stump removed, and pay for the concrete posts, gravel boards and fence panels to be replaced with the proper size ones, but she has point blank said no, her fence doesn't get touched. I have no idea why she didn't ask us about the gravel board, whenever I see her I do smile and say good morning/afternoon etc, so I feel like I am approachable, but she is horrendously rude and deliberately doesn't even acknowledge anyone. Obviously I can say from her point of view but my girls are only young, they only play out in the garden a couple of hours on nice mornings, then back inside out of midday sun, then a couple of hours in the afternoon before in from 4.30pm dinner then bed for 7pm so from my perspective they're not disruptive, they don't run around screaming etc all hours of the day they mostly like to water plants and have tea parties and draw with chalk on the patio. Our other neighbour to our right always compliments how quiet they are. I'm assuming the bigger fence is to block her neighbours out, though a bit daft as she just stands at the gaps between the panels and glares through anyway! Thank you for that, I do really like the idea of just building a second fence next to hers Despair, it seems the easier option than trying to argue with her about anything and cause everyone upset and aggravation. Arbour lad I'm sorry if this is a daft question but could you explain why you've said is a second fence a bad idea? It seems like a very good solution? in your shoes I would inform her that I'm removing my tree stump so will need to temporarily remove that gravel board and panel. she will no doubt tell me that I can't - I'd explain the law allows for this and regardless of her non-acceptance I'll be doing it anyway and I was telling her not asking her. once the stump is removed (shouldn't take long) I'd reinsert the gravel board and panel. then I'd send her a 'thank you' card with an appropriate message. Arbour lad I'm sorry if this is a daft question but could you explain why you've said is a second fence a bad idea? I'll leave it to arborlad to explain, but I agree it is a BAD idea. I appreciate the reasons for stating that a second fence is a bad idea. However there are occasions when it is the best answer to a problem. Neighbours who set out to be difficult and awkward, who refuse to respond to friendly overtures and respond by being downright difficult are, in my experience, best fenced off so we can pretend they do not exist. Being "watched" by a neighbour continously is extremely stressful. A 6 foot fence covered in summer by roses etc is much preferable. I really don't dare do that Mac! She would go absolutely mental, and no doubt have the police on my doorstep for criminal damage or something, regardless of whether she was right to do so. My father visited for the afternoon with his spaniel last year and she was playing with a ball in the back garden while we were in the kitchen with the door open and it started drizzling, and you know how spaniels love getting wet, she was having a blast. The week later, not even joking, the RSPCA turned up because "someone" had phoned and reported us by saying we were cruelly neglecting our dog by keeping it locked out in the rain. Yes they apologised when I invited them in to show that we have two fat beloved house cats that couldn't be better cared for, and no dog, but it is the principle of the thing, upsetting and completely unnecessary, so I am truthfully more than a little anxious about what she would do, given she's made it very clear I'm not to go near it. As you can imagine a second fence does sound vastly more appealing! so what if plod comes knocking? the copper will just tell her to stop wasting police time. I reckon a couple of handy fellas could wedge the gravel board and panel up a foot or so for all of twenty minutes whilst they removed the stump - give her advanced warning you'll be doing it, tell her you've informed plod (having informed plod), then get on with it. when the dust settles the stump will be gone and you'll have a disgruntled neighbour. leave things as they are and you have a stump and a disgruntled neighbour. how do you propose to get your own fence installed with the stump in situ?